This timeless picture book is a little charmer which delivers a message about perseverance, hard work and generosity, all told without a single word. The illustrations are spare and classic, as is the bicycle, this could be the '50s. There's no brightness here, with the manilla flavoured background, pencil drawings with touches of grey and less of green watercolour. It's the spirit of the little girl that adds the spark. She and her brother are walking past the shops when she sees a green bicycle in a shop window. She checks her piggy bank when she gets home but there's not enough for the bicycle so she decides to earn the money. She has a lemonade stand, searches down the back of the sofa, sells her toys, then has the brainstorm - doing chores for the neighbours. She finds a lady down the street who has her help rake the leaves, but this is just the beginning of a special relationship. As the seasons go by we see the girl and the lady working together. While walking the lady's dog the girl spots the bicycle again and when she counts out her money she has enough, but when she returns to the store the bike is gone. In spite of her disappointment she makes a generous choice and buys a tricycle for her little brother with her money instead. There's a lovely turnaround ending that finishes it just so, reinforcing the spirit of generosity, and reward for a job well done. I loved the relationship between the older woman and the little girl - you can see their fondness for each other, there are hugs and mugs of steaming drinks, and they work together. The siblings are also linked together beautifully. The boy is always present when his sister is, except when she is working with the lady, he's always slightly behind, sometimes pulled along by the hand, or in the background playing with the cat. At the woman's home her dog is always the extra presence. Although the pages have lots of empty space there's always a little something happening in addition to the main momentum of the story - the boy tries to pick up a coin from the pavement but they're moving to fast; the dog chases a squirrel up a tree. Ordinary things, but as you leaf through the pages, in the absence of text, your eye sweeps across the page picking up details you didn't see the first time around. This is the joy of wordless stories, you are rewriting it every time you read the book. On his website, Mark Pett calls himself an authorstrator - a title he adopted after a 5-year-old boy at a school visit asked him "How do you like being an authorstrator?" One of my favourite places to read about picture books is Julie Danielson's blog Seven Impossible Things Before Breakfast. You can read about the predecessor and companion book to The Girl and the Bicycle, also wordless - The Boy and the Airplane. 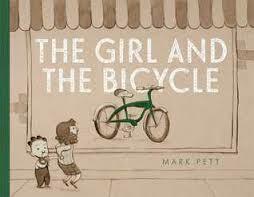 I'll have to look that one up too - I wonder if it's the same boy as we see in The Girl and the Bicycle.